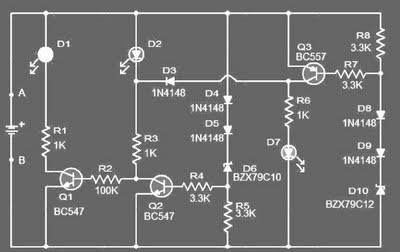 This circuit can be used to monitor the voltage level of a car battery. When the battery voltage is 11.5V or less the transistor Q1 is on and D1 glowing.When LED battery voltage is between 11.5 to 13.5 V, the transistor Q2 is on and the glowing LED D2 . When the battery voltage is above 13.5 V, the transistor Q3 is on and the LED D3 will be bright. The 12 volt control can be connected between terminals A and B and for the convenience of using LEDs of different colors.